St Michael and All Angels was built in the Norman period, then enlarged in the 14th century, with a west tower added in the 15th century. 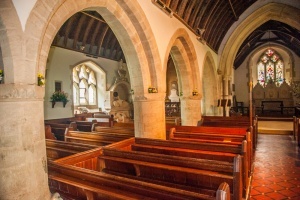 A north aisle was added in 1628, then the entire church was rebuilt in 1877. The first record of a rector comes from 1340 but there was a church here for several centuries before then. The oldest part of the church is the 12th century arcade, with its huge early Norman piers with scalloped capitals. You can see where the original Norman pillars were cut away by masons in the 13th century when the rounded arcade arches were replaced by pointed Gothic arches. The altar table is a lovely Elizabethan piece and also in the chancel are a pair of 18th century monuments and a candelabra of the same date. On the south wall is a stained glass window in memory of Reverend Thomas Putt, a rector of the parish who built the Farway school. Putt gave his name to the Tom Putt apple variety grown in local orchards. 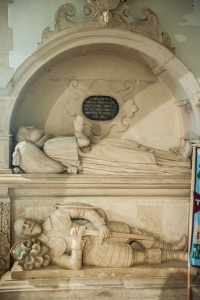 In the north aisle is an attractive 17th century monument, with a pair of reclining effigies, one above the other. The topmost effigy commemorates Sir Edmund Prideaux, Baronet (1554-1629) and shows Sir Edmund in his lawyers robes. Sir Edmund bought the Netherton estate, formerly held by Canonsleigh Priory, and built Netherton Hall in 1607. The Hall is set on the slope of the valley east of the church. Below Sir Edmund's effigy is another effigy of a man in armour, possibly Sir Edmund's grandson, Peter Prideaux, who died in 1643 at the age of 25. According to a local tale, Humphrey Hutchins was ploughing land at the top of the hill when his plough turned up a crock of gold. He gave part of this miraculous treasure to the church to rebuild the north aisle. The field where Hutchins discovered his golden hoard is still known as Money Acre. In the churchyard are a pair of old yew trees. The largest measures 25 feet around the base and is thought to be 800 years old. The East Devon Way long distance path runs directly past the church.